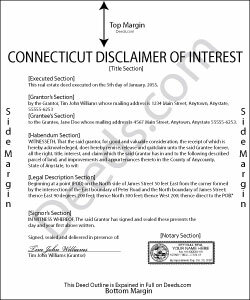 Under the Connecticut statutes, the beneficiary of an interest in property may renounce the gift, either in part or in full (General Statutes 802g-45a-578 to 590). Note that the option to disclaim is only available to beneficiaries who have not acted in any way to indicate acceptance or ownership of the interest. The disclaimer must be in writing and include a description of the interest, a declaration of intent to disclaim all or a defined portion of the interest, and be signed by the disclaimant (802g-45a-579 & 583 (c)). Deliver the disclaimer within nine months of the transfer (e.g., the death of the creator of the interest) to the legal representative of the decedent's estate, or with the probate court having jurisdiction over said estate (802g-45a-579 & 583 (d) (3)). In the case of real property, record a copy of the disclaimer in the office of the town clerk in the town in which the property is situated in order to make it effective against any person other than the disclaimant (802g-45a-579 & 583 (d) (4)). Carlin L. said: I have yet to have my Certification of Trust notarized nor have I gone to my bank to see if it's acceptable I hope it will be it was rather easy to do thank you so much. Reply from Staff: Thank you for your feedback Carlin. Susan C. said: easy to use to get copy of documents. given your website by recorder in the country offices. Reply from Staff: Thank you Susan, we appreciate your feedback. nancy h. said: Once I figured out what I wanted it was great! Reply from Staff: Thank you Nancy.